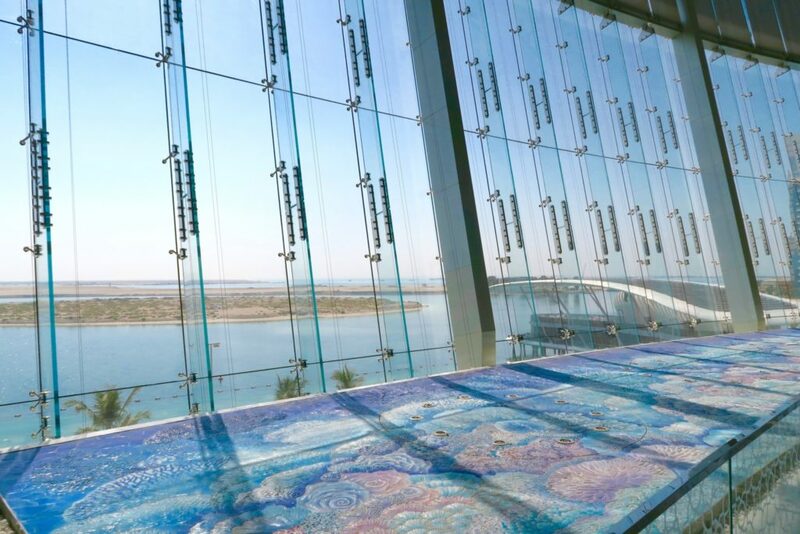 Hotel Review: Jumeirah at Etihad Towers, Abu Dhabi - Holy Smithereens! 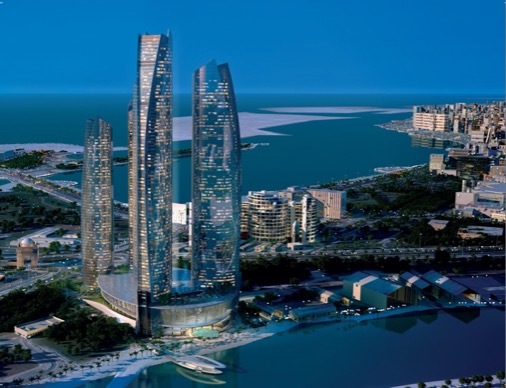 The Jumierah at Etihad Towers is one of five towers that make up a stunning , towering complex. 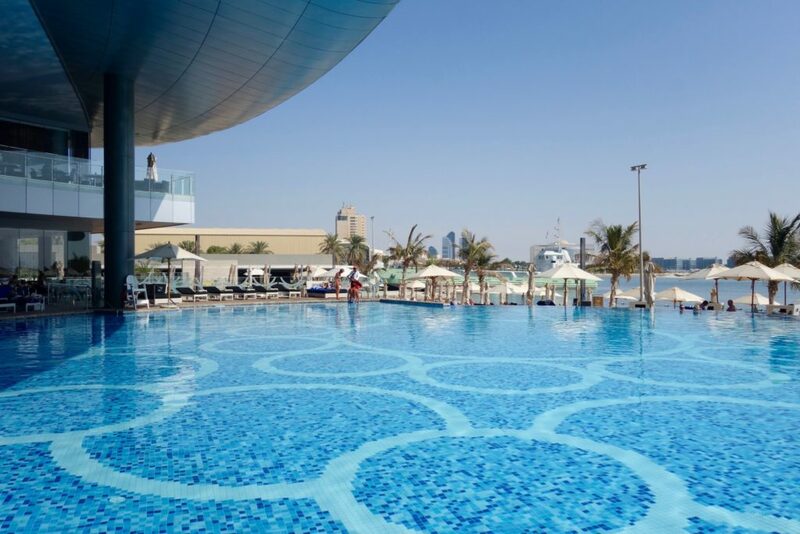 With three swimming pools, a private beach, 12 restaurants and bars – this hotel offers a dizzying array of luxury served in such elevated heights. But first, speaking of heights. 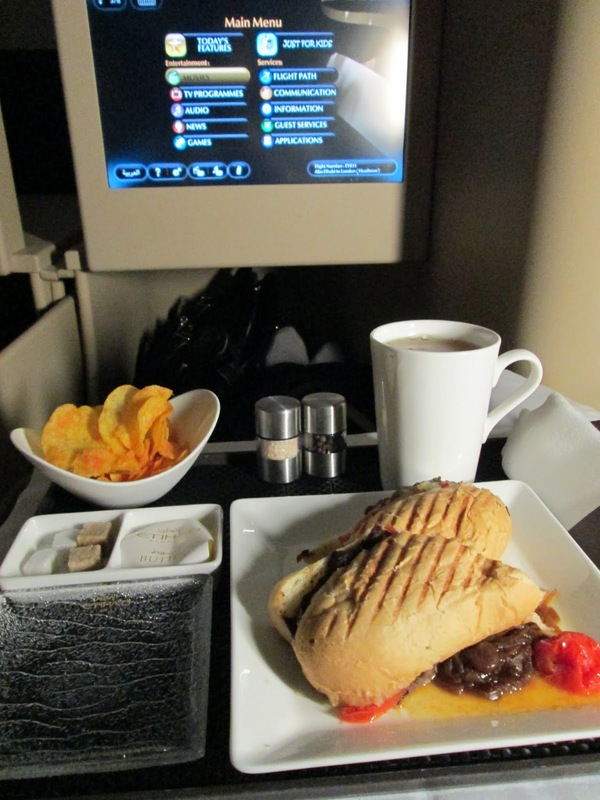 We had an early evening flight from London to Dubai. 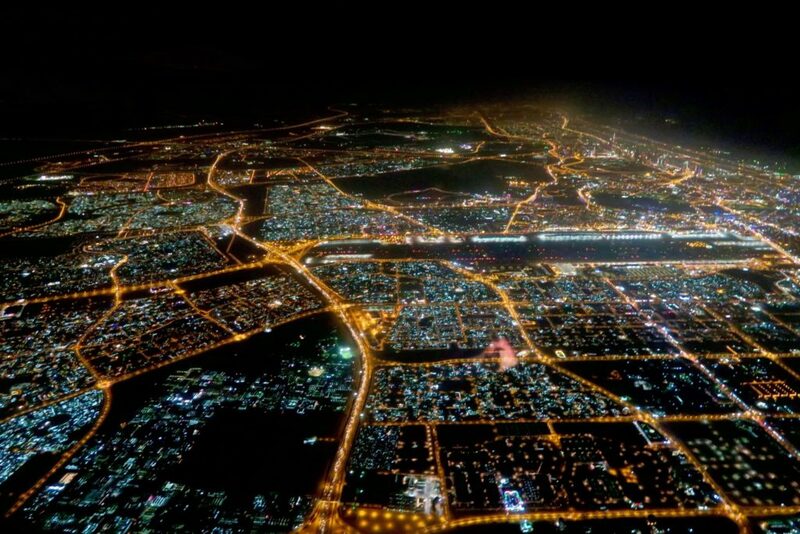 When we commenced our descent to Dubai, I fell asleep, with my head cradled comfortably by the window. My eyes just opened momentarily when I saw this unbelievable view. Approaching Dubai. Or is that an electric circuit board? This took my sleepiness away with a jolt. I’ve always known Dubai is a cosmopolitan city of lights, but nothing prepared me for this organised, massive circuit board party with pulsating electric veins. We arranged for a private transfer to Abu Dhabi. It takes about 2 hours to drive from Dubai to Abu Dhabi. And since it was late at night, the drive was extremely smooth. 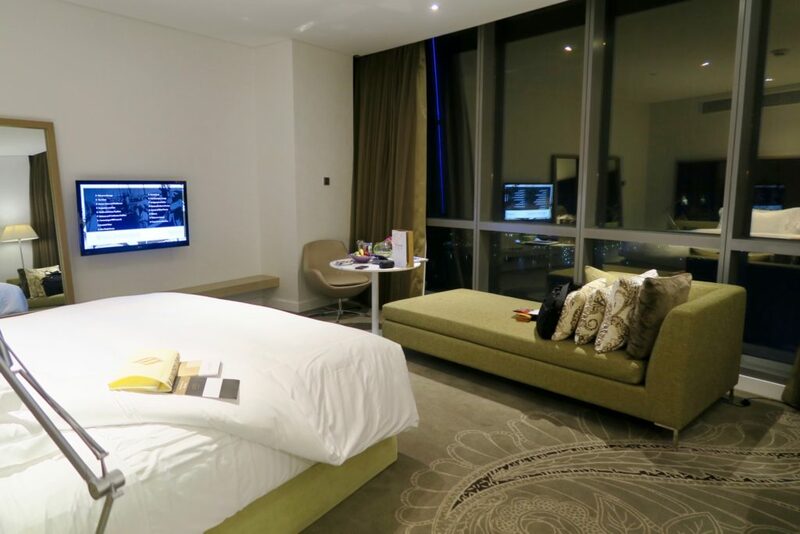 I fell asleep again, and woke up when we reached Abu Dhabi. The sight of the Etihad Towers while the car approached is quite stunning. It’s extremely hard to take a photograph from a moving vehicle, so the photo above will do. The five towers all differ in height. The highest measures 305 metres (74 floors) and the lowest 277 metres (55 floors). 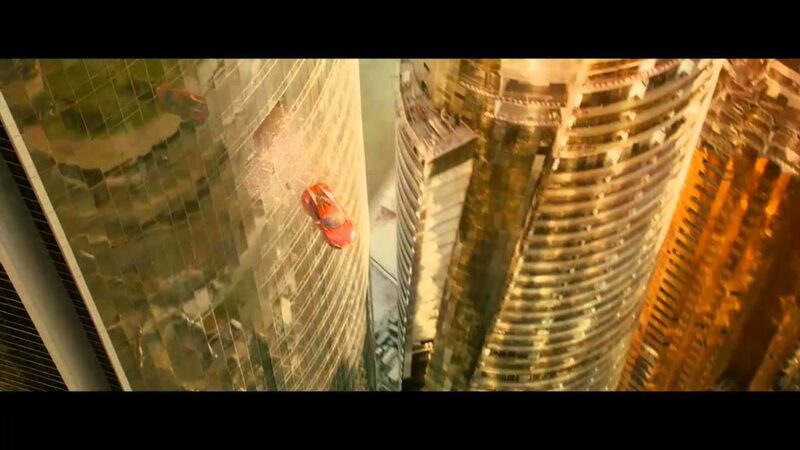 One of the most iconic (and unrealistic) stunts in a movie – when Vin Diesel flies a car from one tower to another. Easy! Now back to the real world. We arrived past 2AM and check-in at the desk was quick. My first impression: I was amazed how well-lit and dazzling everything was at that hour! We were spent after a 7 hour flight and a 2 hour ride to Abu Dhabi. And just the sight of our room managed to soothe the exhaustion. 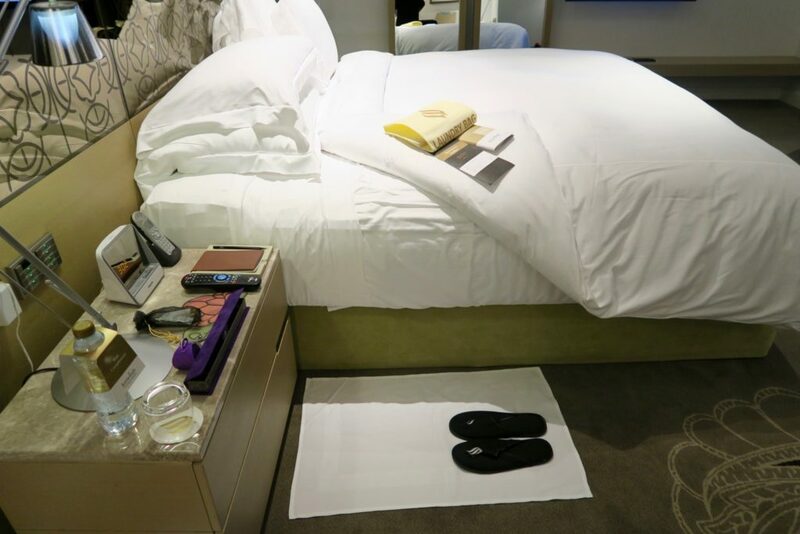 As we arrived past 2AM, turn down service was already given and this made me just want to plonk down the bed. Welcome amenity were chocolates and dates. I am not really a date person. I love it as an ingridient in dessert (sticky date pudding!) but not as a whole. But these were unbelievably good! Chewy and fresh with fillings like seasme and pistachio. 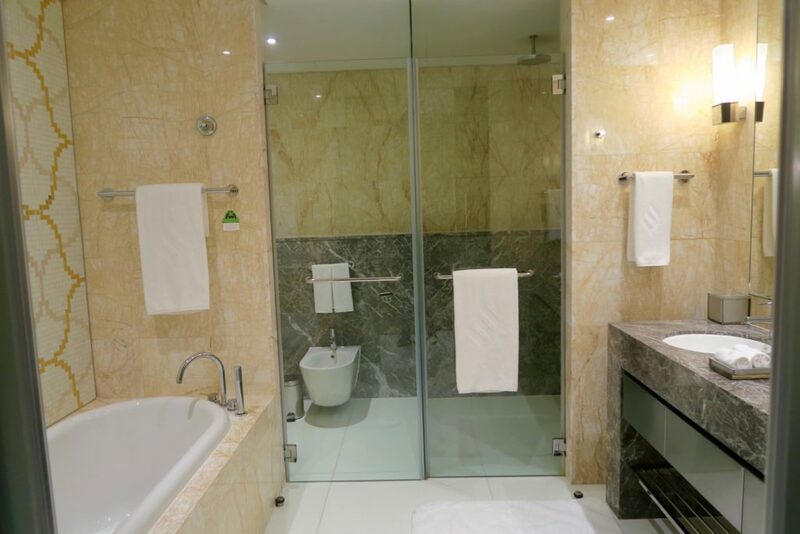 Double doors open to a spacious marbled bathroom. Double sink with heated floors. Do not judge the packaging. Bee Kind was an amazing brand. All toiletries were without parabens, and the shampoo was amazing. It left my hair clean with volume. 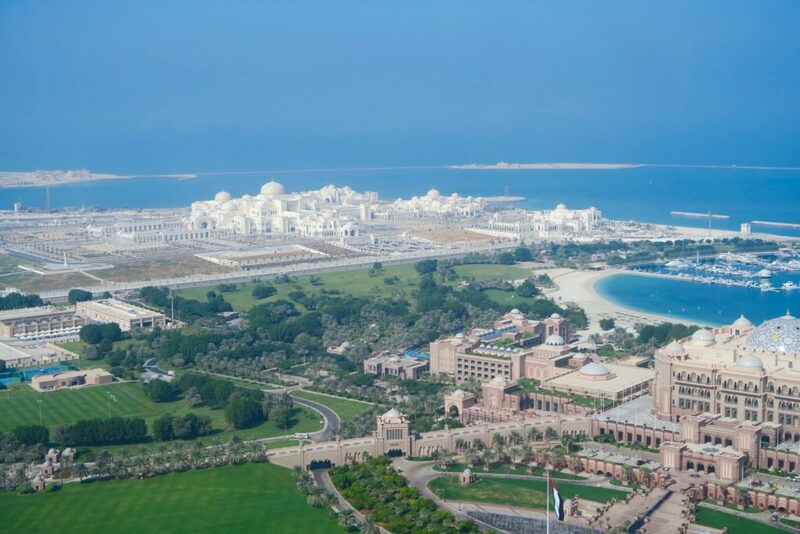 It was when we woke up in the morning that we saw the full glory of Jumeirah at Etihad Towers. 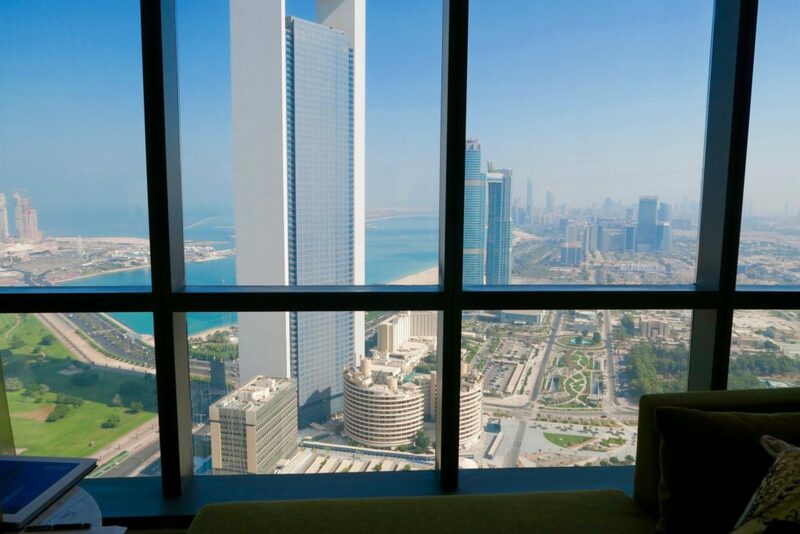 Imagine waking up to this stunning view of Abu Dhabi! I like that Abu Dhabi doesn’t have that much skyscrapers yet (compared to Dubai). I hope it remains that way. Catching a lift to go down for breakfast, I caught a close-up view of these guys cleaning the windows of the neighboring tower. It’s astounding to think of how much work (and lives risked) is involved to maintain the gleam of these towers! Even on ground zero, the surroundings are still sunny as it is filled with lots of natural light. 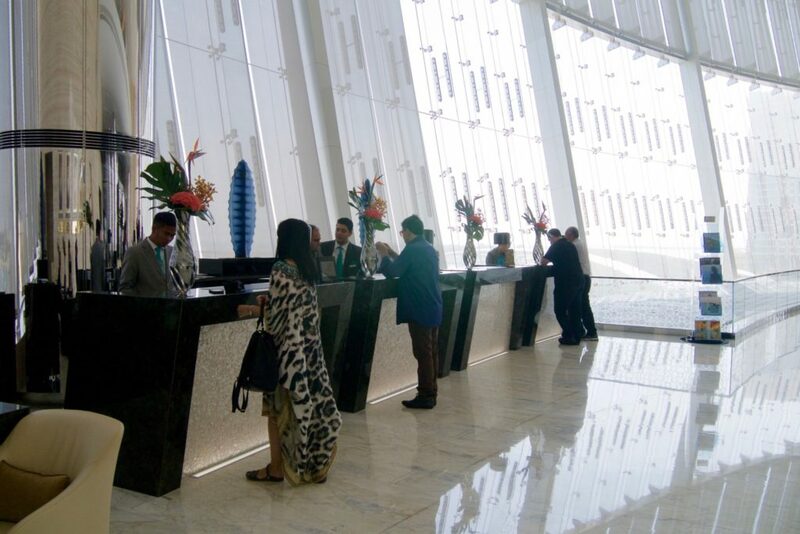 One thing I noticed, even though the hotel was busy and there were quite a number of people in the lobby, the hotel is somehow relatively quiet. 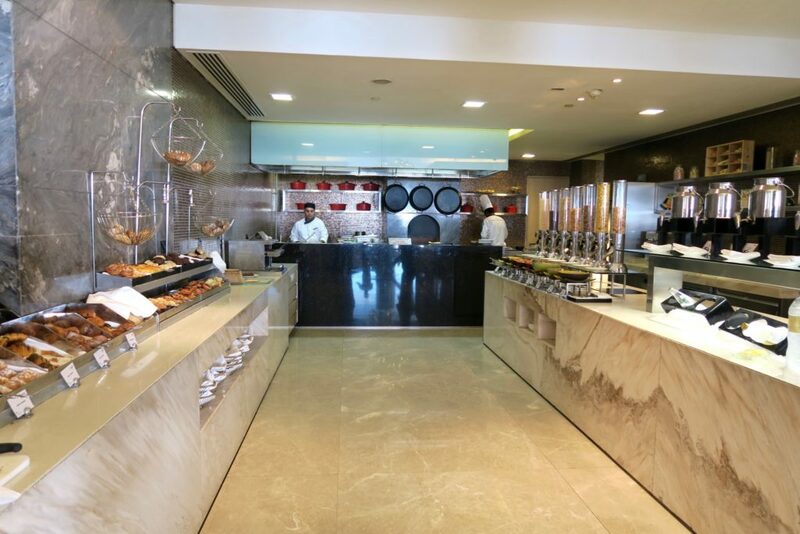 Breakfast buffet at Rosewater Restaurant was quite a grand affair. There are separate areas / mini buffet halls for different kinds of food (Asian, Western, Middle-Eastern) and even though we arrived towards the tail end of breakfast, we never found a tray with insufficient food. 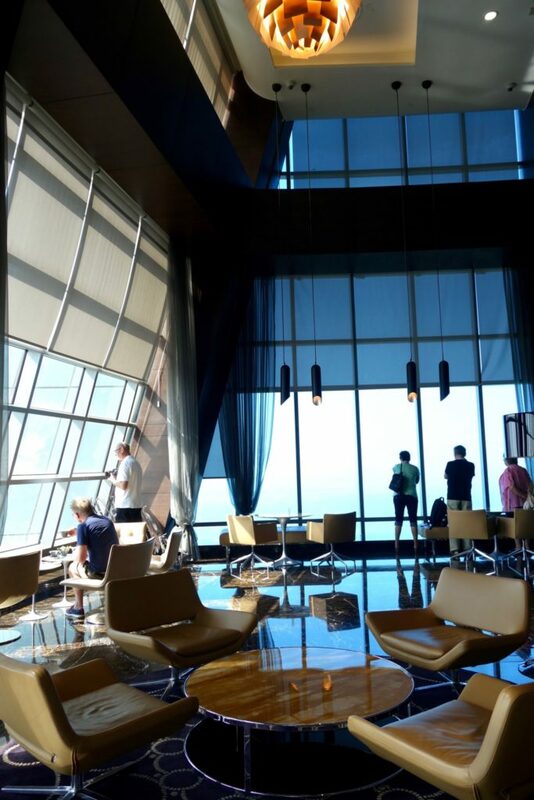 Guests can have high tea while enjoying the views of Abu Dhabi. It’s almost like looking down from a landing aircraft. Oh, the 300 in the name Obersvation Deck at 300 refers to your location on the 74th level, which is 300 metres above the ground. 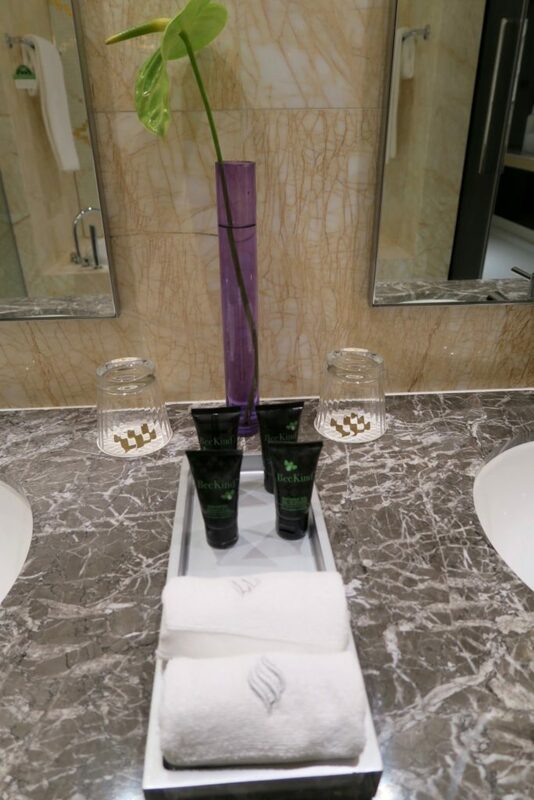 If there’s another thing that Jumeirah at Etihad Towers takes to another level, it’s the little touches of customer service that I encountered in my short stay. that gentleman in reception attending to me in the above photo. When I approached the desk, no one was standing before him so I thought he was available. He was furiously typing/ working on his computer and he glanced up and kindly advised me that he was in the middle of finishing something. He offered for me to sit and would call me and ‘save my spot’ even if someone approaches his desk while I’m seated. Yes, a small gesture but many times, I’ve encountered staff who may just glance at me and say “will be with you in a second” or silently gesture that as well. the concierge team was also lovely. They patiently helped us try to get to Ferrari World ( about a 30-40 minute drive) the quickest time possible as we were under time constraint. Also, John from concierge, who even followed and ran after us in the lift, huffing and puffing, just to give ANOTHER suggestion how to get to Ferrari World. It’s small gestures like this that make a big difference to me. Again, the level of hospitality in the Middle East (in general) can be notches above the norm so I’m always pleased when luxuries of this calibre are met with human touch. 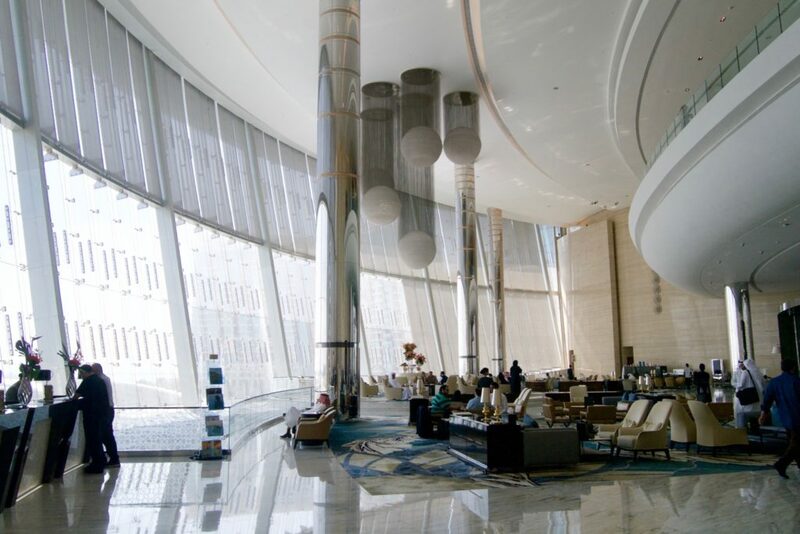 Rates at the Jumeirah at Etihad Towers start at AED 490.00 (AUD 177.00) on low season. You can always find special rates online. Have you been to the Middle East? What are your impressions, and do you agree that once you have experienced Middle East hospitality, you are spoiled for life? 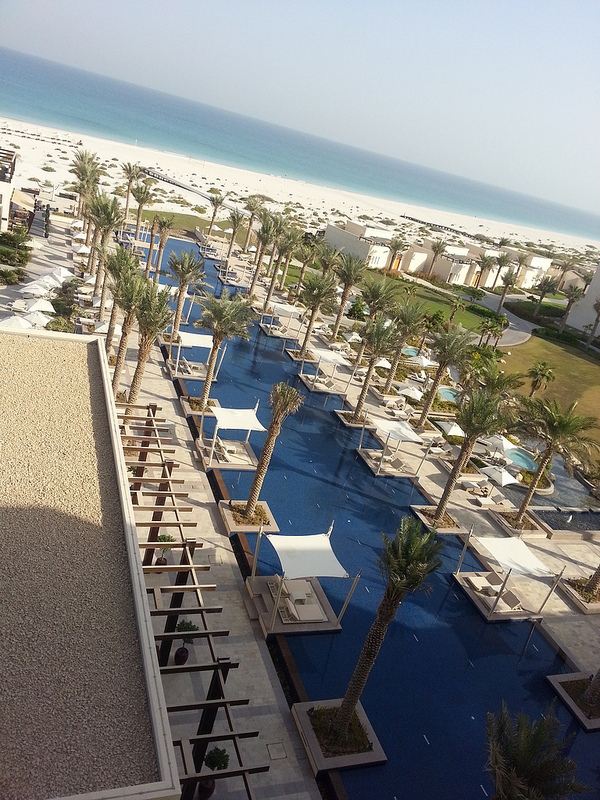 We were guests of Jumeirah at Etihad Towers, but all views and opinions expressed are my own. That looks amazing! 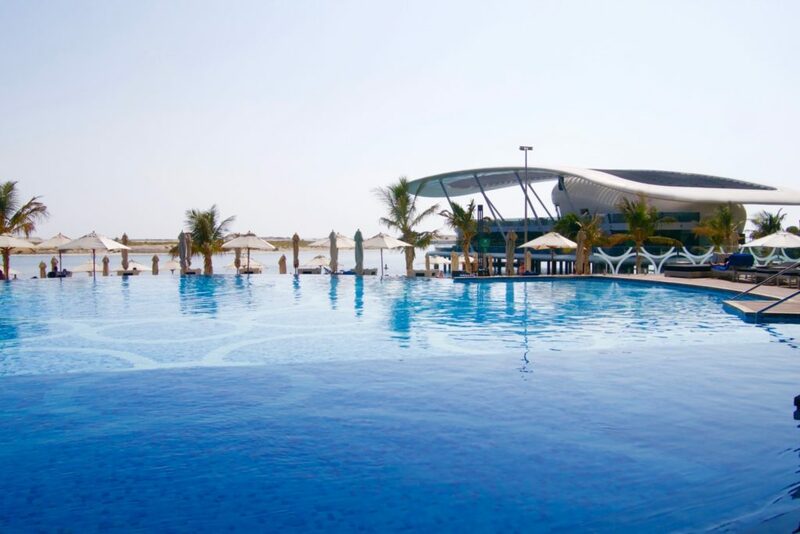 We’ve been to Dubai, but not Abu Dhabi. 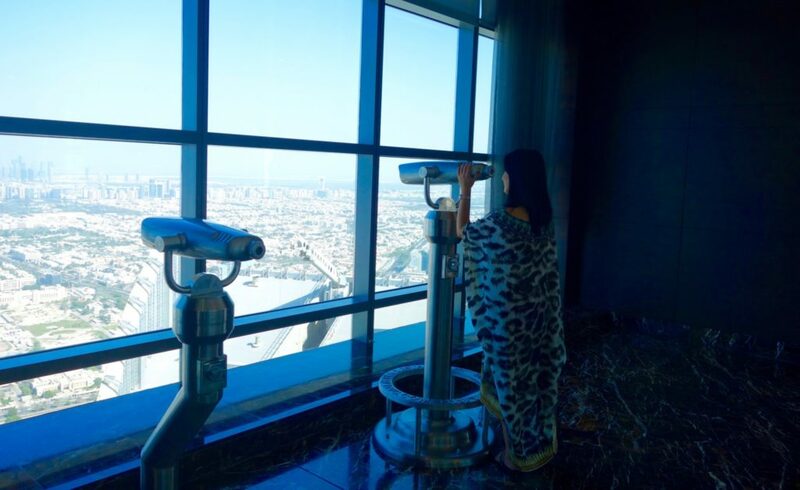 After reading this and looking at your amazing photos, I’m totally inspired to stay at Jumeirah at Etihad Towers! That’s an amazing view and those prices in low season are reasonable for all the luxury and comfort. 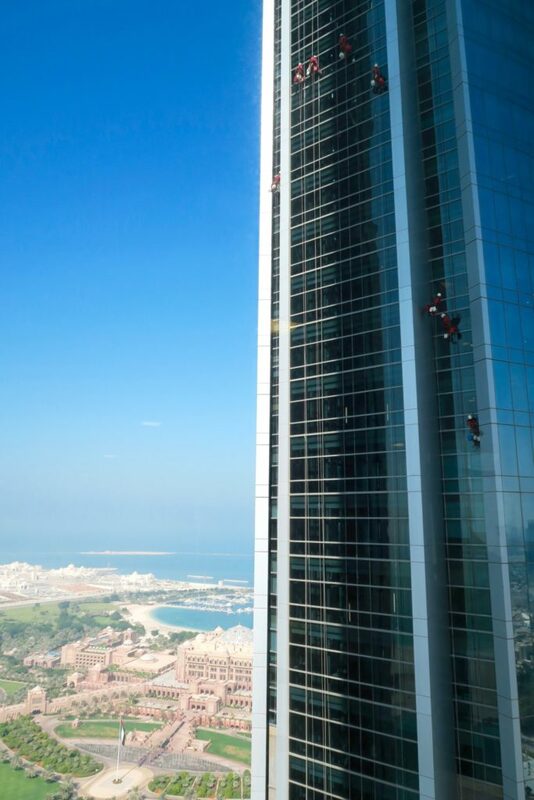 Incredible shot of the guys cleaning the windows on the nearby building via cables. Wow. 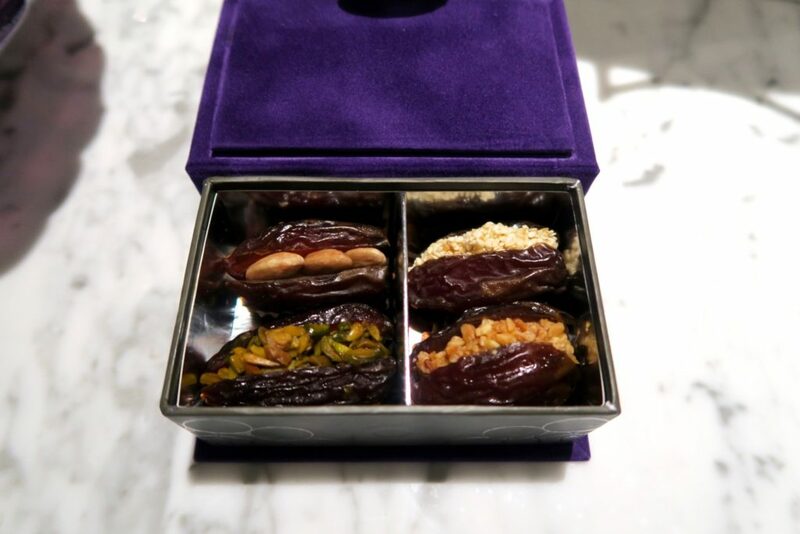 I good love dates, and I LOVE dates stuffed with pistachios! I’m sold on a stay here! Hello I’ve also been to Dubai but never Abu Dhabi. Must try to get there next time. Big fan of the Jumeirah brand here. Gorgeous, delightful, instructive. Another great hotel review, a pleasure to read! 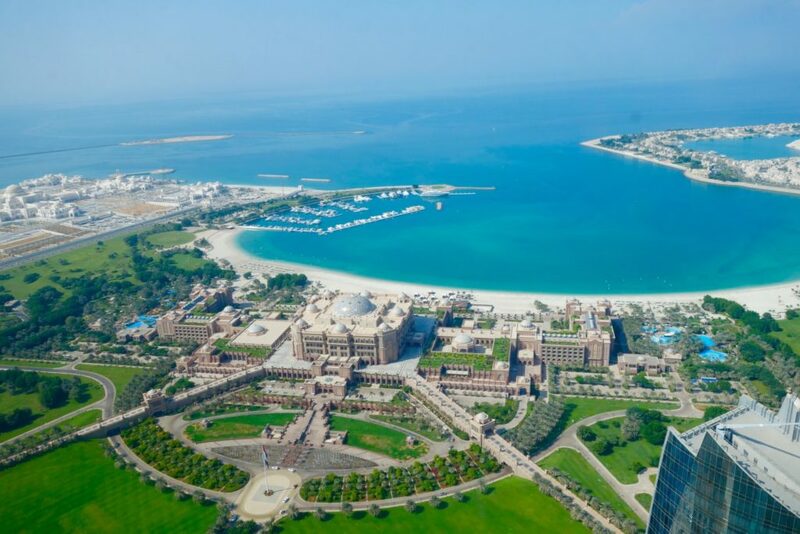 Next time in Dubai I have to try the Burj Al Arab 6-star hotel..